It’s only a week to go before the first round of the French presidential election and it seems that the race is wide open. Only two candidates can take part in the second round in May. But who will those two be? Extreme right-wing Front National candidate Marine Le Pen has been the front runner in the polls over the last year, but her support has been slipping. Ex-socialist minister and centrist darling of the bourgeois media, Emmanuel Macron is neck and neck with Le Pen, both at around 22-23%. The official conservative (Republican) candidate Francois Fillon should be ahead, but he has been damaged by the expenses scandal of his wife and children getting huge government-funded salaries for parliamentary work which they did not do. Even so, Fillon is getting about 18-19% share of those saying they will vote. 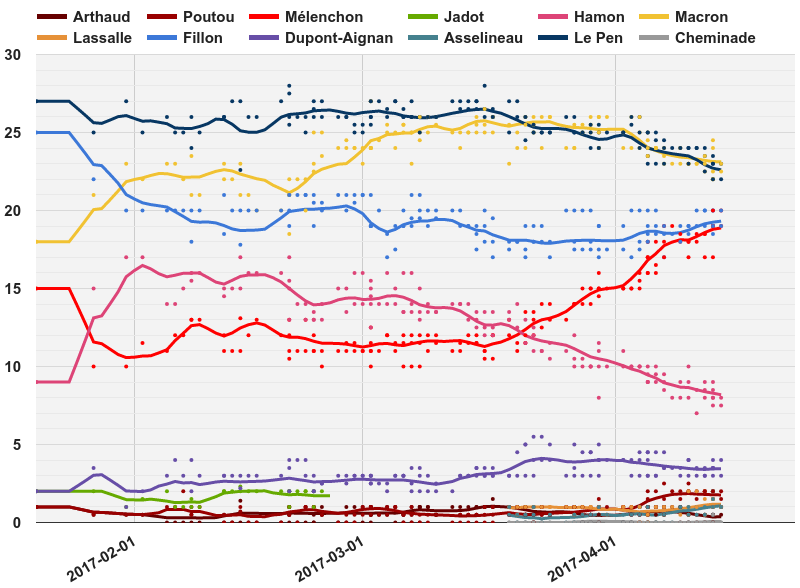 The big surprise in the last few weeks had been the rise of Leftist candidate Jean-Luc Melenchon, whose polling has leapt from 10-11% to around 19% now. In so doing, the official Socialist party candidate, Benoit Hamon, has seen his vote slump to 6-7%. It is still most likely that it will be Le Pen and Macron in the second round, with Macron more than likely to win the presidency by some distance over Le Pen. But all combinations are possible, with the worst for French capital being a battle between leftist Eurosceptic, anti-NATO Melenchon and racist Eurosceptic Le Pen. Back in February I analysed the state of the French economy, the second-largest in mainland Europe and one of top ten capitalist economies globally. The profitability of French capital is at a post-war low (profitability is still down a staggering 22% since the peak just before the global financial crash in 2007), real GDP growth is only just over 1% a year, well below that of Germany. The unemployment rate remains stuck close to 10% compared to just 3.9% in Germany. Youth unemployment is 24%. Business investment has stagnated in the ‘recovery’ since 2009. Because of the actions of the French labour movement, inequalities of income and wealth have not risen as much as in other G7 countries like the US and the UK in the last 30 years. Neoliberal policies have been less effective in getting profitability up and workers down under the thumb of capital. French capital needs a president that can and will do this now. Can it find one? If we look at the programs of each candidate, we can see it is Francois Fillon who offers the best programme for the interests of French capital. Fillon aims to end the key gain of the French labour movement, the official 35-week, often firmly enforced. Under Fillon, workers would have to put in 39 hours before overtime or time-off in lieu is paid. Fillon would slash the public sector workforce by 500,000 (or 10%), while increasing the working week for those who keep their jobs. The retirement age would be raised to 65 from 62 now and everybody would have to work to that age or face pension loss. Unemployment benefits would be cut. Severe fiscal austerity would be imposed with a cut in public sector spending from the (astronomically high for capitalism) 57% of GDP to 50%, with a ‘balanced budget’. The cuts would be necessary because Fillon wants to cut corporate tax rates to 25% and other ‘burdens’ on the business sector, while raising VAT for purchases by French households by 2% pts. He would scrap the current wealth tax on the rich. One area of extra spending would be more police and more prisons, while reducing gay rights. This is an outright neo-liberal program that no French president has been able to impose successfully in the last 30 years. But French capital demands it. Unfortunately, for big business, Fillon is unlikely to make the presidency. But what of Macron, the ex-banker and socialist minister, the man most likely to get into the Elysee Palace (the French White House)? Macron’s program is a mix that attempts to appeal to labour and capital, as though they could be reconciled. He wants to merge public and private pension and benefit schemes. He claims that he will get the unemployment rate down to 7% through an investment plan. And yet he plans to cut public sector spending and run a tight budget. Like Fillon, he would cut corporate tax for businesses to 25% of declared profits. He keeps the 35-hour week, but companies would be allowed to ‘negotiate’ a longer week. Low-wage earners would be exempted from certain social welfare levies, a measure that would put an extra month’s wage per year in the employee’s pocket (but no clarity on how this would be paid for, except through ‘higher growth’). He too would boost police and prisons but also provide a ‘payment for culture’ to students and reduce school class sizes. He would cut the number of MPs and reduce time for re-election of officials, while banning Fillon-type payments to family members. This programme is thus a mix of help to business and wishful thinking for labour. But it seems to appeal to just enough voters over the neoliberal alternative of Fillon. Both Fillon and Macron are pro-EU and pro-euro. This is the one big policy difference with Le Pen and Melenchon. Le Pen’s program is a mixture of racist, anti-immigrant, anti-EU policies alongside pro-labour measures for the public sector and wages. Le Pen would ‘re-negotiate’ the EU treaty with the rest of the EU and if that failed, call a referendum on leaving the EU within six months. If French voters decided to stay in the EU, she would resign the presidency. If they voted to leave, France would end the euro as its currency and re-introduce the franc. Such a policy would be shattering for the French economy and probably sound the death-knell of the EU and the euro as we know it. Le Pen would get on with ending immigration, strip many French muslims of citizenship, revoke international trade treaties and NATO operations and confine free education to French citizens only. Companies employing foreigners would pay an extra 10% tax and foreign imports would be subject to a 3% tax. And, of course, the police forces would be expanded. Like the Brexiters in the UK referendum, she claims that she can cut taxes on average households and raise welfare benefits by saving money on EU membership and regulations (that has turned out to be a myth in the UK, where austerity has increased). The number of MPS would be halved. But Le Pen also aims to help (small) business with lower taxes. And instead of raising the retirement age, as Fillon proposes, she would cut it to 60 years, increase benefits to the old and to children, while keeping the working week at 35 hours and overtime tax-free! Le Pen’s economic policy is thus anathema to French capital and attractive to French labour, but combined with racist and nationalist measures. But, of course, there is no real attack on the hegemony of French big business. So this policy of raising wages and benefits while leaving the euro and introducing protectionism, in an economic world of low growth and a possible new economic slump, is utopian. Neither the needs of labour nor capital will be met. When we turn to Melenchon, we see a similar utopianism, if from the perspective of defending the interests of labour over capital. His economic program is similar to that of Corbyn’s Labour in the UK, if going further. He proposes a 100-billion-euro economic stimulus plan funded by government borrowing and some nationalisation in sectors such as the motorway network. He says he would raise public spending by 275 billion euros to fund the plan, to raise minimum and public sector wages, create jobs to reduce the unemployment rate to 6% and also, like Le Pen, cut the retirement age to 60. This extra spending would, Keynesian-like, fund itself from higher economic growth and employment. But with big business needing profits to invest, calling for more taxes on business (as well as the rich), may deliver the opposite of faster growth. At the same time, he too would cut corporate tax rates to 25%! Melenchon would also renegotiate the EU treaties, ignore the EU fiscal austerity pact, call for a devaluation of the euro, take national control of the Banque de France from the ECB and leave NATO and the IMF. And following Le Pen, if these measures are blocked, he would have a referendum on EU membership. Melenchon’s program is similar to that of socialist Francois Mitterand (although somewhat less radical than Mitterand’s) when the latter won the presidency in 1981. He too wanted to take France on an independent line from the rest of Europe in expanding the economy through public spending, nationalisation and more taxes on business and the rich. That program fell down in face of the deep global slump in 1980-2, when financial investors fled France and the franc. The choice then was for Mitterand to go the whole hog and take control from French capital or capitulate to neoliberal policies. He chose the latter with his so-called “tournant de la rigueur” (austerity turn) in 1983. That choice would soon face Melenchon, in the unlikely event that he won the presidency. Apart from the economic utopianism of Le Pen and Melenchon under capitalism, they both face an immediate political problem. In June, the French vote for a new National Assembly, which, at least right now, would probably elect a majority of conservative pro-capital, pro-EU MPs who would be backed by a media campaign from big business, the EU Commission and other EU governments aiming to shackle the new president. The battle would be on from day one, while the euro and French financial assets reel from the shock. This entry was posted on April 16, 2017 at 6:37 am and is filed under capitalism, economics, Profitability. You can follow any responses to this entry through the RSS 2.0 feed. You can leave a response, or trackback from your own site. Well, nuance is usually not associated with FN, or other near fascist or fascist organizations. In this case, the nuance is that Le Pen says she is for this, retirement at 60, and that, lower taxes on small businesses, etc.– and none of that matters. That’s all misdirection for what the FN is all about and will be all about. Born from the resentment over the defeat in Algeria, the embodiment of the resentment of displaced settlers, the FN can pretend to be about an “economic” program, but “economics” is a code for anti-immigrants, and anti-immigration is but a code for repression of those already residents who are of a different color, a different religion. “Economics” is always a code for something else. If Mitterand had tried to “go the whole hog and take control from French capital” there would have been an armed coup as in Chile, no? His political strategy was doomed regardless. An interesting class analysis of the upcoming French Presidential elections. Once again, the class struggle over control and ownership of the wealth labour produces is at the forefront of politics. To be sure, there’s lots of code word dancing around the issue, but mystifications aside, this will be the THE issue, that and the relatively low level of class consciousness amongst the immense majority of the citizens of France which is predicted by Comrade Roberts to result in a political victory for conservatives in the elections to that political State’s parliament in June of this year.